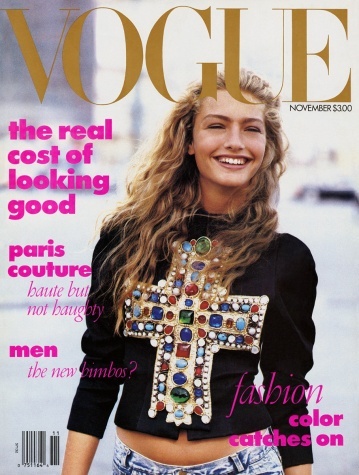 Peter Lindbergh’s 1988 November cover for Vogue Magazine (also Anna Wintour’s debut cover) featured a black jacket by Christian Lacroix, encrusted with a Byzantian-like bejeweled cross. The couture jacket, provocatively styled with a pair of the model’s own acid wash jeans–the model being Israeli model Michaela Bercu– typified the then-novel idea of high-low dressing. Immortalized by the 1988 cover, the famous Lacroix jacket undoubtedly served as inspiration to Urban Outfitter’s “Beach Riot Delano” swimsuit. Michaela Bercu by Peter Lindbergh for Vogue November, 1988. Beach Riot Delano Swimsuit, 2014.